This book is for you. 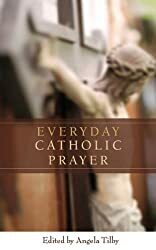 Designed for busy lives and everyday people, Everyday Catholic Prayer provides psalms and Scripture readings for each day of the week, patterned on the liturgy of the hours. This simple book of scriptural and contemplative prayer, with its underlying theme of transformation in Christ, will become a treasured resource for anyone who wants to be part of the ongoing prayer shared by Christians around the world. Angela Tilby compiled this daily prayer book while working as a television producer for the British Broadcasting Corporation. As a lay theologian, she recognized the importance of regularity in prayer and wanted her prayers to mirror those of other Christians around the world, and to tap into the inherited wisdom of the great monastic orders. Since then she has left the media and now teaches Early Church History and Spirituality in the Cambridge Theological Federation. About Angela Tilby (Author) : Angela Tilby is a published author. Published credits of Angela Tilby include Everyday Catholic Prayer.